Monwana Lodge is a homely 4 star lodge, situated in the Greater Kruger National Park, in the private game reserve of Thornybush. Why stay at Monwana Lodge ? Monwana Game Lodge offers draped bed posts to wraparound wooden verandahs – bringing Africa to your doorstep. After the excitement of a day’s game viewing – spend time relaxing around the swimming pool, or perhaps sit on your private deck, watching herds of Elephants stroll past. Personal service, unpretentious comfort, world class cuisine and amazing game viewing await you during your time on Safari. A central boma and the Gazebo decks encourage socialising, perhaps discussing your day’s game viewing with fellow guests – knowing that your can retreat to the privacy of your self-contained luxury suite! 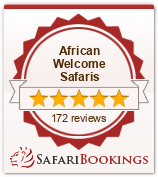 Awe-inspiring views and game safaris are complemented by the 4 star luxury accommodations. There are 4 suites in total; 2 Family suites, 1 luxury King size suite and 1 elegant Honeymoon suite each with its own private deck or patio overlooking rugged bushveld or the peaceful Monwana watering hole. Due to the intimate size of the lodge, a cosy ambiance and comfortable spacious layout has always been of the greatest importance to Monwana Game Lodge staff and guests. The Luxury King size suite provides royal intimacy with its en-suite king size room, king size bed swathed in cloth, adjoining private lounge, open fireplace and mini bar. It also offers a large private deck overlooking the waterhole. The Family suites sleep 4 and provide ultimate family comfort with air-conditioned spacious rooms, large fully equipped bathrooms, luxurious bed linen and an unpretentious style that is at once both homely and graceful. Similarly to the King size suite, the Family suites’ wooded patio allows for fantastic outdoor evening entertaining. The Deluxe Honeymoon suite is the ultimate in indulgence. Offering breathtaking bedroom views, the luxurious open plan bathroom includes a large sunken bath from which to view exquisite vistas over the savannah. The outdoor veranda is carefully designed for intimate entertaining and romantic retreat. All individual suites boast full en-suite bathrooms with both bath and shower facilities. Sweeping panoramic views over the untamed bushveld and ever active waterholes can be viewed from the large glass windows. The day starts as dawn breaks over the African bushveld. After your early morning wakeup call, coffee, tea & rusks are served on the main deck overlooking the riverbed. Shortly after, you depart in your open Land Rover with your experienced Rangers and Trackers who will share their extensive knowledge of the bush with you. These drives are undertaken at times best suited for game viewing which vary depending on the season but typically start early morning. Where applicable you may be invited out of the vehicle to see tracks, examine certain plants and follow spoor. After an exhilarating hunt for tracks to see what the animals have been up to during the night, and tracking down whatever you find, you will stop somewhere out in the bush for a break of coffee & tea. Time to stretch your legs whilst having your sunglasses cleaned & indulge in cool towels in summer, and hot towels in winter. In winter, we keep our guests warm on the vehicle with hot water bottles & warm blankets. After a sumptuous Breakfast is served either back at the camp or in the riverbed or bush, guests are offered walks to suit their interests and fitness levels and are accompanied by an armed ranger and tracker. Walks allow guests a better chance to see some of the smaller creatures of the bush as well as an opportunity to learn more about the flora and fauna of the region & to have a chance to follow tracks in more detail. Our Shangaan trackers will enthral you with their explanations of the medicinal and other uses of the numerous plants and trees along with tales of traditional folklore. The rest of the day is spent at the discretion of the guest for other activities that we offer, with a delicious lunch being served around 1.30pm. The afternoon game drive is preceded by high tea and extends into the evening to view seldom seen nocturnal species by torchlight. Upon returning for a gourmet 3 course dinner, either in the boma, bush or lodge – guests can socialise with a cognac, single malt or cigar around the campfire or lounge before returning to bed for another day’s adventure. Where possible, safaris will be tailored to suit individual preferences and interest. The Thornybush Collection; prides itself on actively welcoming children of all ages at Thornybush Game Lodge and Serondella. The other smaller lodges will accept children provided that the family book sole use of the camp. Children are allocated to specific rangers who enjoy interaction with younger guests. They receive a complimentary children’s pack on arrival, which will keep them entertained and occupied during their stay. Rat packs (cold drinks/cookies) are sent with them on game drives. Drives and activities can be tailored to suit children’s Interests and attention span. Walks are designed to ensure that their safety is taken into account and that they experience activities they might not normally do in the city. Meal requirements and venues are provided if required by parents. Baby sitters and child minders are available (At additional Cost). Picnics Next To The Pool – Packed lunch including sandwiches and Fruit, eaten on a blanket, next to the pool. Educational Walks With Rangers – Short walks with their own ranger . Pointing out insects, tracks of animals, trees and interesting facts. Treasure Hunt – Children have to find clues around the lodge using books from the library, to get to their treasure (a little something supplied by parents).